Earnings are arguably the most important driver of stock prices. 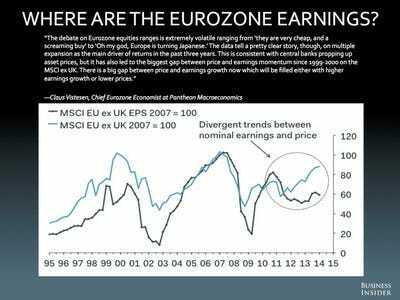 So its a bit jarring to see stock prices and earnings diverge in the European equity markets. There’s a lot going on in Europe. The European economy is flagging. In the second quarter, GDP growth in the Eurozone was an anemic 0.1%, while inflation remains at a tepid 0.4% pace. This has created a conundrum for policy makers, notably European Central Bank president Mario Draghi, who has tried to implement policies to spur growth and inflation. So far, however, Draghi has so far come up short of a full US or Japanese-style quantitative easing program. The ECB will announce its latest policy decision on Thursday. And while stocks in Europe haven’t had a great year, stock prices are still outpacing earnings gains. In our latest Most Important Charts in the World series, Claus Vistesen, chief Eurozone economist at Pantheon Macroeconomics, submitted the following chart, asking the simple, and yet not easily answerable question: where are the Eurozone earnings? A popular investment thesis right now is being short the euro and long European equities, akin to the position taken by investors in late 2012 when the most popular trade in the world was to be short the Japanese yen and long Japanese equities. The thinking here is that if the ECB engages in a QE program that includes the outright purchase of European sovereign debt, the value of the euro will fall and European stocks will rise. But Vistesen notes that the divergence between earnings and price is the kind of action that smacks of central bank intervention, and this is already showing up in European stock prices. Or is there a third path forward for European stocks?